Day 01: Arrive Delhi & transfer to hotel. Day 02: Full day city tour of Old & New Delhi. Day 03: Drive to Nainital. Day 04: Birdwatching around Nainital. Day 05: Drive to Corbett National Park. Day 06: Game drives & time to relax. Day 07: Game drives & time at leisure. Day 08: Drive to Agra & check into resort. Day 09: Visit Taj Mahal & Agra Fort. Day 10: Drive to Chambal Sanctuary (crocodiles) & boat cruise. Day 12: Early morning birding on cycle rickwhaws & time at leisure . Day 14 Morning & afternoon game drives. Day 15: Morning & afternoon game drives. Day 16: Drive to Jaipur & discover the Pink City . Day 17: Morning, elephant ride at Amber Fort followed by city tour. Day 18: Drive back to Delhi via Neemrana and connect flight to UK / Europe. The Park is one of the prime examples of Project Tiger`s conservation efforts in Rajasthan. It covers an area of over 400 sq km with many steep crags embracing a network of lakes and rivers. Atop one of these hills, the 10th century Ranthambhore Fort stands like a silent sentinel. The terrain is a blend of impregnable forests and open bush land. The forest is the typically dry deciduous type with dhokbeing the most prominent tree. 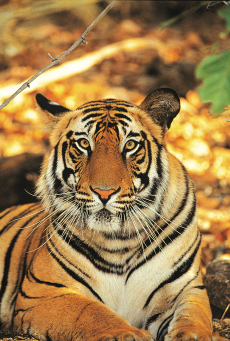 Nestling in the foothills of the Himalayas, the Corbett National Park extends over an area of 520.82sq.km. 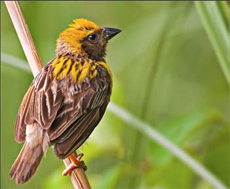 Varied topography and vegetation gives Corbett a rich diversity in habitats and natural beauty. Flat valleys are interspersed with hilly ridges and the Park`s rolling grasslands known as the Chaurs provide visitors with an excellent view of its inhabitants. An astounding 580 species of bird have been sighted here, including great pied hornbills and the rare ibisbill. From February onwards, wild elephants emerge from the sal forests to drink at the river, home to marsh crocodiles and gharial, a river-dwelling fish-eating crocodile. Domesticated elephants are available for safaris in the buffer zone surrounding the park. The National Chambal Sanctuary, located in Etawah, 70 kilometers from Agra is spread over an area of 635 square kilometers. Established in 1979, the park has a rare collection of exotic, rarely found species. The unusual Gangetic dolphin is the main attraction of National Chambal sanctuary. 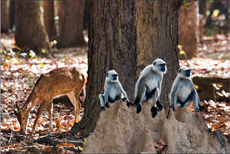 Besides, the park is also inhabited by chinkara, sambar deer, nilgai, wolf and wild boar. The River Chambal is one of the country`s most beautiful and least polluted river systems. It is the mainstay for the entire wildlife of the sanctuary, harboring a variety of aquatic life, including the elusive Gangetic Dolphin, Marsh Crocodile, Gharial or Fish Eating Crocodile, Freshwater Turtles, River Otters and a various species of fish. The river now boasts of a population of over 1600 Gharials and 200 Crocodiles. 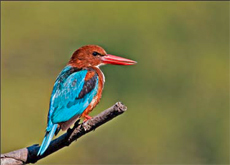 Bharatpur is popular for its bird sanctuary - the Keoladeo Ghana National Park - finest in Asia, inundated with over 400 species of water birds. The sanctuary covers an area of 40 sq. km of swampy, lightly wooded terrain which was once the private hunting and shooting preserve of the Maharaja of Bharatpur. Today it is the protected breeding ground for many species of birds and also the home of migratory birds, especially of the Siberian Crane, that spends its winter here (2 birds have already been sighted this year). Colonies of cormorants, spoonbills, storks, egrets, herons, pelicans, ibis and grey herons can be spotted all over the park, besides a fairly rich habitation of deers and snakes. Agra is famous as the home to one of the Seven Wonders of the World - the Taj Mahal. The architectural splendour of the mausoleums, the fort and the palaces in Agra are a vivid reminder of the opulence of the legendary Mughal Empire. Agra was their capital for nearly a hundred years from 1564. A pleasant town, with a comparatively easy pace, Agra is known for its superb inlay work on marble and soapstone, by artisans who are hereditary craft persons. Carpets, gold thread embroidery and leather shoes are other items of interest. Jaipur is a city where royalty still lives in the grandeur of its palaces, where fighting for the honour of the clan has never been a need but a way of life, and where treating guests as gods has been a tradition from time immemorial. The city is located at a distance of around 258 kms from Delhi and 232 kms from Agra making it a part of the famed Golden Triangle tourist circuit of North India. Jaipur got its name from its founder Sawai Jai Singh (1693-1743), who had the vision to create a meticulously planned city as his capital. All the houses in the old city are painted pink, including the famous Hawa Mahal, thereby giving the city its alternative name, the Pink City.